compound object creates a set of spheres from geometry or particles, and connects the spheres together as if they were made of a soft, liquid substance. When the spheres move within a certain distance of one another, they connect together. When they move apart, they take on a spherical form again. In the 3D industry, the general term for spheres that operate in this way is metaballs. The BlobMesh compound object generates metaballs based on specified objects in the scene, and the metaballs, in turn, form a mesh result called a blobmesh. 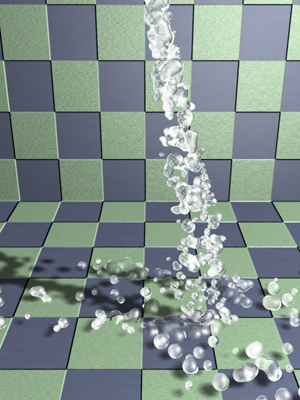 A blobmesh is ideal for simulating thick liquids and soft substances that move and flow when animated. For geometry and shapes, a metaball is placed at each vertex, and the size of each metaball is determined by the size of the original BlobMesh object. Soft selection can be used to vary the sizes of the metaballs. For particles, a metaball is placed at each particle, and the size of each metaball is determined by the size of the particle on which it’s based. For helpers, a metaball is placed at the pivot point, and the size of the metaball is determined by the original BlobMesh object. Note: You can apply motion blur to a BlobMesh object to enhance the effects of motion in renderings. For particle systems other than Particle Flow, use Image motion blur. For Particle Flow particle systems and all other types of objects including geometry, shapes, and helpers, use Object motion blur. Create one or more geometry or helper objects. If the scene requires animation, animate the objects as desired. Click BlobMesh, and click anywhere on the screen to create the initial metaball. Go to the Modify panel. In the Blob Objects group, click Add. Select the objects you wish to use to create metaballs. A metaball appears at each vertex of each selected object, or at the centers of helper objects. In the Parameters rollout, set the Size parameter as necessary to cause the metaballs to connect. Create a geometry object, and convert it to an Editable Mesh or Editable Poly. Apply a Mesh Select modifier to the object, and select some of the vertices on the object. In the Soft Selection rollout, turn on Use Soft Selection. Set the Falloff value as desired. Apply a Turn to Mesh or Turn to Poly modifier to the object. This will retain the soft selection and pass it up the stack regardless of whether you exit the sub-object mode. On the Create panel, with (Geometry) active, choose Compound Objects from the drop-down list. On the Object Type rollout, turn on BlobMesh. Click anywhere in a viewport to create the initial metaball. In the Blob Objects group, click Add. Select the Editable Mesh or Editable Poly object. A metaball appears at each vertex of the selected object. In the Parameters rollout, turn on Use Soft Selection. Metaballs are limited to those vertices that are affected by the soft selection. Set the Size and Min. Size parameters to set the sizes of the metaballs. Create the spline, and convert it to an Editable Spline. In the Rendering rollout, turn on both Enable In Renderer and Enable In Viewport. Apply a Mesh Select modifier, and select the appropriate vertices for soft selection. In the Blob Objects group, click Add. Select the Editable Spline. When you use BlobMesh with a particle system, a metaball is created at each particle’s location. The size of the metaball is determined by the size of the particle. Create a particle system, and set up its parameters to animate the particles. In the Blob Objects group, click Add. Select the particle system. A metaball appears at each particle in the system. If you have added a Particle Flow system to the blobmesh and you want to create metaballs only for particles in specific events, click Add on the Particle Flow Parameters rollout to choose the events from a list. Tip: If you need to prevent the particles from rendering, do not hide them as this can prevent the blobmesh from generating correctly. Instead, turn off the particle system’s Renderable option on the Object Properties dialog. The radius of each metaball for objects other than particles. For particles, the size of each metaball is determined by the size of the particle, which is set by parameters in the particle system. Default=20. Note: The apparent size of the metaballs is affected by the Tension value. When Tension is set to its lowest possible value, the radius of each metaball accurately reflects the Size setting. Higher Tension values will tighten the surface, and make the metaballs smaller. Determines how relaxed or tight the surface will be. A smaller value makes a looser surface. This value can range from 0.01 to 1.0. Default=1.0. Sets the coarseness, or density, of the resulting blobmesh. When Relative Coarseness (see following) is off, the Render and Viewport values set the absolute height and width of blobmesh faces, and lower values create a smoother, denser mesh. When Relative Coarseness is on, the height and width of blobmesh faces is determined by the ratio of metaball size to this value. In this case, higher values create a denser mesh. Range (both)=0.001 to 1000.0. Render default=3.0, Viewport default =6.0. The lower end of the range for both Coarseness settings is 0.001, which allows for high-resolution metaball geometry when Relative Coarseness is off. Using such low values can also cause lengthy calculation delays; if this happens and you wish to halt calculation, press Esc. Determines how the coarseness values will be used. If this option is turned off, the Render Coarseness and View Coarseness values are absolute, where the height and width of each face on the blobmesh is always equal to the coarseness value. This means the faces on the blobmesh will retain a fixed size even if the metaballs change size. If this option is turned on, the size of each blobmesh face is based on the ratio of the metaball size to the coarseness, which will cause the blobmesh face size to change as the metaballs become larger or smaller. Default=Off. This option provides an alternate method for calculating and displaying the blobmesh. This method is more efficient than the default method only when a large number of metaballs are present, such as 2,000 or more. Turn on this option only when using a particle system or other object that produces a large number of metaballs. Default=Off. Turns off the display of the blobmesh in viewports. The blobmesh will still appearing in renderings. Default=Off. If soft selection has been used on geometry you add to the blobmesh, turning on this option causes the soft selection to be used for the size and placement of metaballs. Metaballs are placed at selected vertices with the size set by the Size parameter. For vertices that lie within the falloff set on the geometry’s Soft Selection rollout, smaller metaballs are placed. For vertices outside the falloff, no metaballs are placed. This option has an effect only if the Vertex sub-object level for the geometry is still enabled, and Use Soft Selection on the geometry’s Soft Selection rollout is turned on. If Use Soft Selection is turned off either for the blobmesh for the geometry, metaballs are placed at all vertices on the geometry. Default=Off. Min Size Sets the minimum size for metaballs within the falloff when Use Soft Selection is turned on. Default=10.0. Lists objects in the scene that are part of the blobmesh simulation. Allows you to pick objects or particle systems from the screen to add to the blobmesh. Displays a selection dialog where you can select objects or particle systems to add to the blobmesh. Removes objects or particles from the blobmesh. Use this rollout if you have added a Particle Flow system to the blobmesh, and want particles to generate metaballs only during specific events. Before you can specify events on this rollout, you must add the Particle Flow system to the blobmesh on the Parameters rollout. When turned on, all Particle Flow Events will generate metaballs. 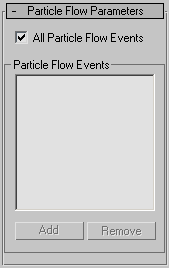 When turned off, only Particle Flow Events specified in the PFlow Events list will generate metaballs. Lists PFlow events that are part of the blobmesh simulation. Displays a list of PFlow events in the scene so you can pick events to add to the PFlow Events list. Removes the selected event from the PFlow Events list.